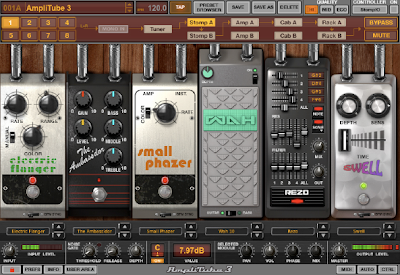 I’ve long been a big user of IK Multimedia’s AmpliTube series – while I use quite a lot of different amp sims, I definitely return to AmpliTube the most often, and no less a discriminating pair of ears than Steve Vai’s complimented me on the tones I pulled from AmpliTube 2. (Well, the mouth part of Steve Vai said that, not his ears… but I kinda backed myself into a corner with that sentence and the only way to get out again was to write this sentence…). Well now IK Multimedia is launching AmpliTube 3, and it looks like it’s going to be absolutely killer, adding some monster sounds from AmpliTube Jimi Hendrix and Metal, as well as quite a few other additions and improvements. The addition I’m most excited about is the freely movable microphone placement. Awesome! 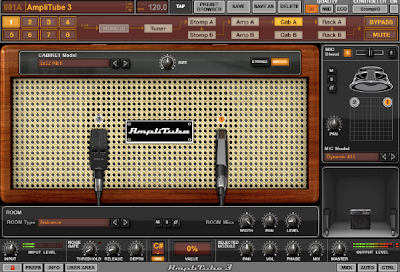 of the leading guitar and bass tone gear-modeling software. AmpliTube 3 raises the industry standard of sound variety, realism and creative power – with over 160 precisely modeled pieces of vintage and modern gear available in one package, it is the ultimate tone gear collection for players, producers, engineers. including models from the most sought-after vintage collections and modern day workhorses. You’ll get 51 individual stompboxes and effects, 31 amplifier, preamp & power sections, 46 speaker cabinet models, 15 high-end stage and studio mics, and 17 post-amp rack effects. Plus, with the new AmpliTube 3 open architecture, you can add more packages as you need them, like AmpliTube Fender™ and Ampeg® SVX. Face it — the better you sound, the better you play. AmpliTube 3 unleashes more creative power than ever, helping you to easily carve new, truly unique voices for your guitar, bass, keyboard, drum and vocals. Our new creative effects let you create sounds you’ve never heard before, and the new “drag & drop” effects’ configuration feature lets you quickly experiment with effects in the signal chain to get that totally unique sound. AmpliTube 3 is the voice for your soul. With the largest collection of ultra-accurately modeled gear, creative effects and flexible routing features, you’ll never run out of sonic possibilities. Every sound you’ve heard before, and even ones you haven’t dreamed of yet…find them here in AmpliTube 3. – New, integrated 4-track recorder/player allows you to capture and layer your ideas quickly and easily right at the moment of inspiration. Preorders are already available in the IK Online Store and in our network of selected dealers and distributors worldwide. awww Peter, you are such a great guy!